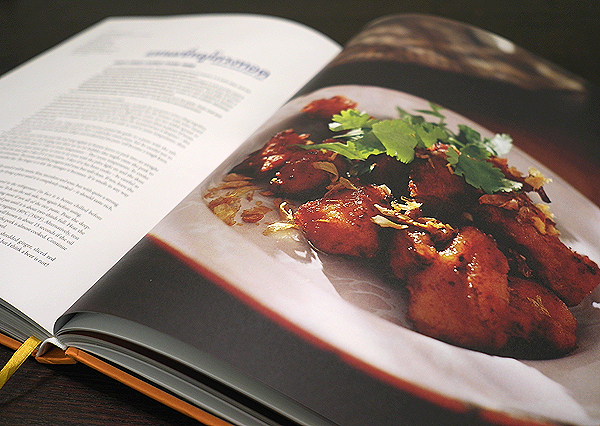 David Thompson’s ‘Thai Street Food’ is one of those rare cookbooks that not only looks amazing displayed on the coffee table, it also boasts highly accessible recipes that make it a real joy to use. In fact my well-thumbed copy has spent so much time on the kitchen counter that I’ve only just gotten around to reviewing it despite having acquired it late last year. Having spent significant time in Thailand, the Australian-born chef and author is well-versed in the regional cuisine, and his restaurant Nahm (one of only two Thai Michelin-starred Thai restaurants in the world – the other being Kinn Kinn in Copenhagen) is a testament to this. 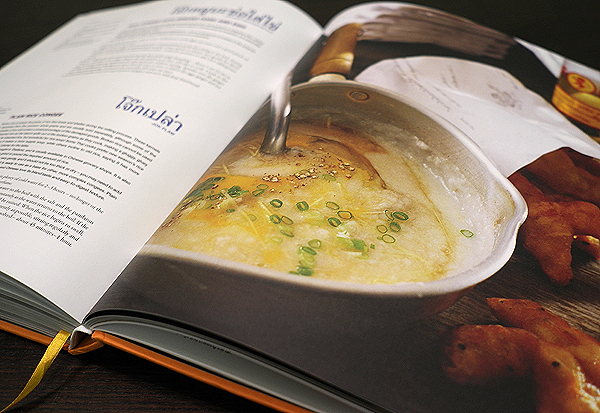 The sizeable orange-hued volume is sectioned into Morning, Noon and Night, taking the reader on a journey through the hot dusty streets of Thailand from the colourful markets stirring in the early hours, to the smoky hawker stalls that peddle steaming bowls of noodles late into the night. It features page after page of enticing treats: banana leaf-wrapped sticky rice eaten at dawn, silken Kanom Jin Noodles slurped hastily at midday, and more elaborate made-to-order dishes tucked into with rice at the end of the day – this book had me contemplating booking myself a seat on the next plane to Bangkok. Arresting images and mouth-watering recipes aside, it is an absorbing read and I found the multi-cultural influences on Thai street fare particularly interesting. Chicken Braised in Rice with Turmeric Spices takes its roots from the Indian Biryani, Beef Laksa containing dried rather than fresh prawns of the Malay original and a host of Chinese-inspired offerings like Five-Spiced Braised Pork Hocks and Rice Congee. For the purists, all the traditional favourites are also present, including various Curries, Green Papaya Salad, Pat Thai, Stir-Fried Minced Beef with Chillies and Holy Basil and Mango with Sticky Rice. Everything I’ve created with the help of David’s concise, well-written recipes has been a success. Sticky Grilled Pork Skewers were sweetly savoury and so tasty that two of us easily put away a portion meant for four and Roast Duck Noodles swam in a rich intense broth. Next to tackle on my list are the Deep-Fried Cured Pork Ribs which I’ve shied away from until now as the meat needs to ferment at room temperature for 2-5 days. 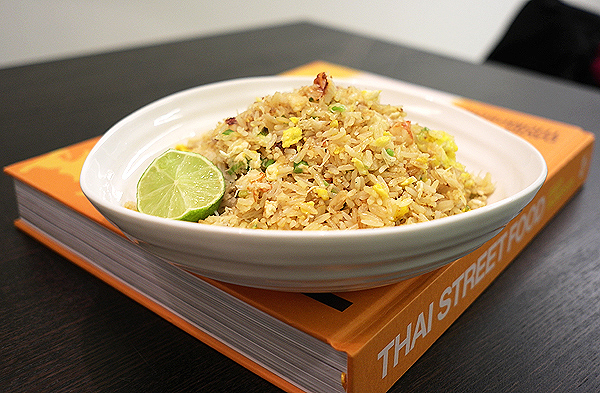 This Crab Fried Rice requires few ingredients, is simple to prepare and brings me right back to the sunny beaches of Phuket each time I make it. In the past I’ve always used cold day-old rice and added eggs to the wok last when frying rice but Thompson cracks in the eggs first then throws in freshly cooked rice (left to cool briefly), which results in fantastic fluffy grains. The delicate crabmeat is the star here so be sparing with the soy sauce – add a scant tablespoon first then tweak according to taste. I actually cut the suggested amount slightly in the recipe below as my first attempt came out too salty, especially when eaten with the chillies in fish sauce which provide extra seasoning. Combine the Chillies in Fish Sauce ingredients and set aside for serving. Crush garlic with salt to form a coarse paste with a pestle and mortar, or simply mince the garlic and mix in the salt. Heat a wok on a low-medium heat together with 2 tbsp of the oil and stir in the garlic paste. Fry until aromatic and starting to colour, then crack in the eggs, allowing them to set slightly before stirring and scrambling. While the eggs are still soft and not fully-cooked, throw in the rice and turn the flame to low. Mix and toss the rice, handling it gently and ensuring all the grains are coated with oil and egg. If it appears to dry add an extra drizzle of oil (not too much though – the rice should not be swimming in it). Season with half the soy, sugar and pepper, and continue to fry until well combined. Taste and add more soy as needed. Stir in the crab meat and spring onions, reserving a little to sprinkle over the fried rice when serving if you wish. Spoon onto two plates and top with the reserved crabmeat and spring onions. Serve with coriander, lime wedges, cucumber slices and a small bowl of chillies in fish sauce on the side. 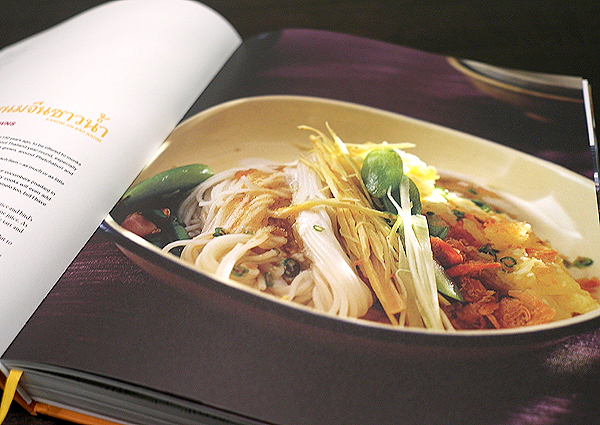 Thai Street Food by David Thompson is available on Amazon (RRP £40). Many thanks to Conran Octopus for kindly providing the review copy. ~ by gourmettraveller on March 16, 2011. Just booked for Bangkok so im all excited now , 5 weeks to wait.Im going to have to try Nahm in Bangkok as ive not been there before , im normally happy enough eating fantastic food on the street. New camera just been ordered yesterday for my trip , Panasonic Lumix , a Leica in a different body and a hell of a lot lighter than the Canon 7D armoured personnel carrier. That is so amazing, you have no idea how much I would just love this…such a crab fan! I would love to own this cookbook. This looks like an amazing fried rice. It sure doesn’t take much to make me want to jump on a plane to Bangkok – one of my favourite foodie cities. The adaptation of other cuisines and dishes without losing the essence of what makes it Thai, is why Thai food is one of the world’s great cuisines I reckon. And I like that this book explores this. Did you use fresh crab meat in this, or would tinned do (I’ve yet to try tinned crab, so I have no idea whether it isn’t bad or totally horrible)? Fresh. Have never tried the tinned stuff myself either but don’t think it would work too well as it’s the crab’s subtle sweetness that makes this dish. I used tinned crab, the one with the whole lumps. I actually rinsed it, seasoned it and stir fried it for a minute or so in garlic flavoured oil before putting it aside to add to the rice towards the end. It really got rid of that raw fishy taste that I had on my previous attempts.